1. To make the dressing, whisk together lime zest and juice, peanut butter, marmalade, soya sauce, hot sauce and olive oil until smooth. 2. 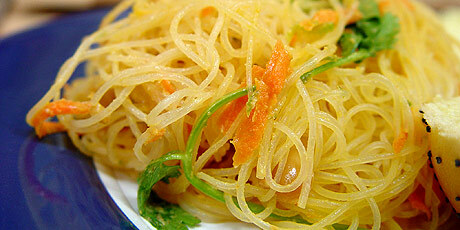 Place the rice vermicelli, green onions, cilantro and carrot into a salad bowl and add dressing. Toss well and garnish with peanuts.